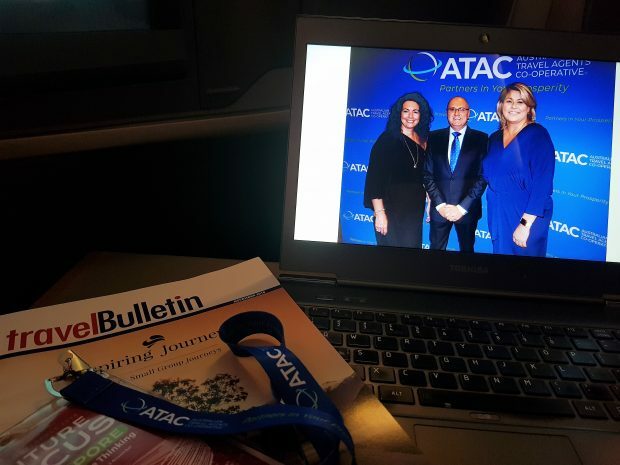 Travel Daily took the 9:30am SQ288 flight from Singapore to Sydney recently and experienced the business class service aboard the B777-300ER aircraft that flies this route. The business class cabin has a 1-2-1 seating configuration and our seat was 22D. 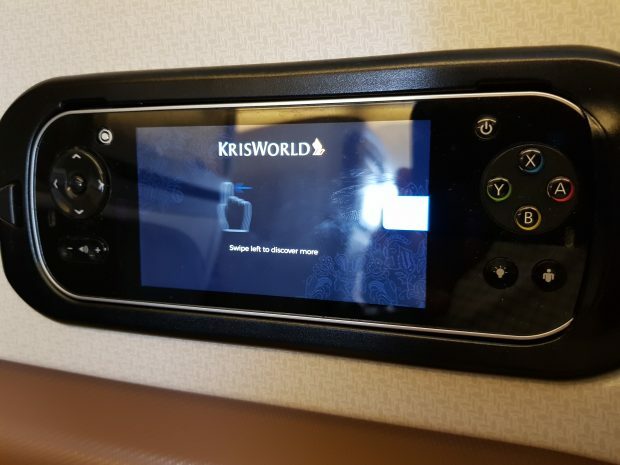 This aircraft is one of the newest additions to the Singapore fleet and has updated seats, 48 of which are in business class as well as an enhanced entertainment system and more ports for electronic devices. Prior to embarkation, we spent an hour in the SilverKris lounge. 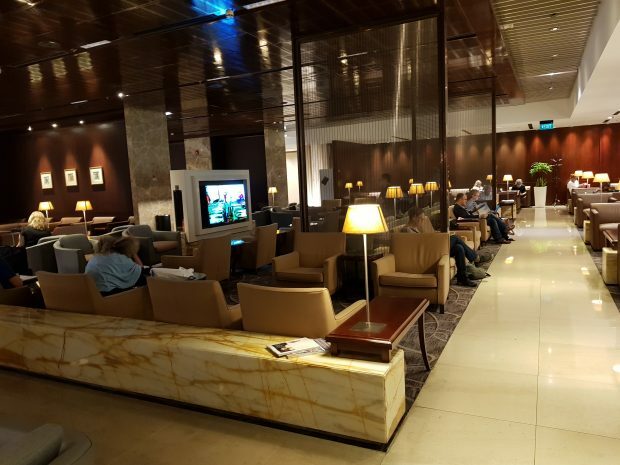 Given we’re at Singapore’s hub you have to expect that the lounge is going to be busy at all hours of the day and night, however there’s plenty of seating areas, the noise levels are low and there’s an abundance of food and drinks to satiate your pre-flight needs. Upon embarkation and stowing your hand luggage, a member of staff provides you with several drink options as you settle into your seat. There’s a 55 inch pitch with 28 inch width and reclines to a fully flat bed which spans 78 inches. A mattress, pillow, socks and slippers are also provided to ensure restful slumber. One of the features of the seat is the multiple storage areas for keeping your items tucked away. iPads, phones, bottle of water, toiletries kit, handbag and books can all be stowed away when not in use and this helps to free up space and create a sense of uncluttered roominess. The dining menu was a delight to see with a variety of Asian and western cuisine topped with an extensive drinks list. 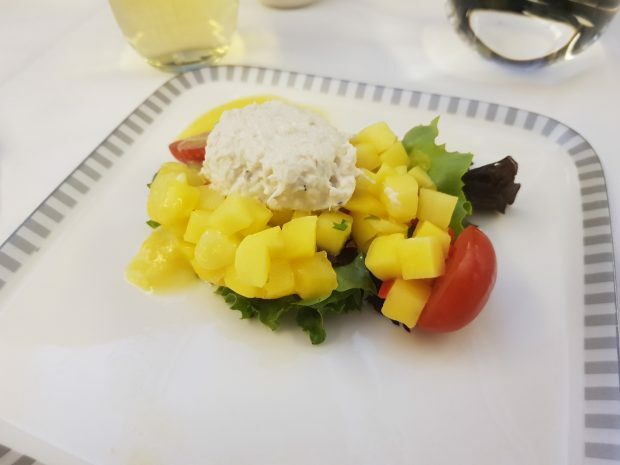 The appetiser was a salad of colossal crab served with mango and citrus dressing. Four our main meal, it was the mee goreng featuring seafood and vegetables. Other options included the grilled beef fillet with red wine sauce, Singapore chicken rice or the seared lamb loin in rosemary sauce. 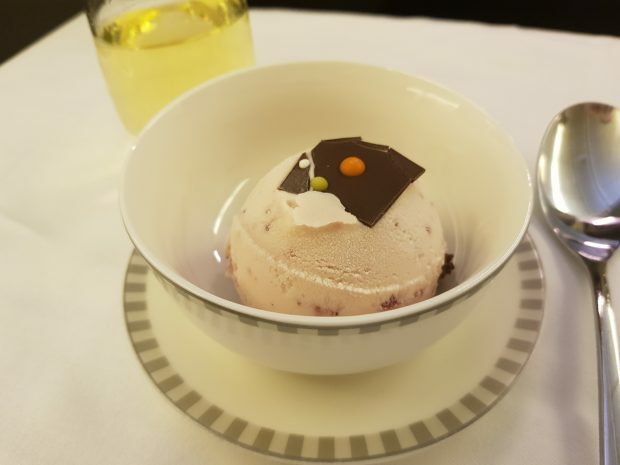 And the dessert was the Haagen Dazs strawberry ice cream or the alternative was a tiramisu with coffee sauce. A selection of cheese consisting of brie, stilton and asiago was also on offer accompanied with fruit, nut paste and crackers. Having feasted on all this, just enough room was left to sample a praline or two along with a freshly made Illy coffee. Entertainment was driven via the hand control docked next to the seat armrest. Unlike Singapore Airline’s A380-800 in business class where the seat back TV is a touch screen, the B777-300ER is not. This took a little to get used to given our familiarity with the touch screen format aboard the A380. The flight was scheduled to take just under eight hours which meant there was time to watch a new release movie and catch up on some work. Keeping the laptop powered whilst perched on the lap tray and using the adjustable spotlight, the set up is conducive for work. A signature Singapore Sling was freshly prepared to help get the creative juices flowing. 30mb of in-flight WiFi data is provided complimentary but note that this can be exhausted quite quickly by downloading large files. For sending and receiving emails or browsing social media posts, the 30mb should be fine. Additional packages can be purchased which increase the amount of data that can be consumed. Once work was done and with time to spare it would have been remiss not to try the fully lay flat bed which can be prepared by staff via the call alert button. Given the length of the bed, it’s easy enough to accommodate sleeping preferences whether that’s lying flat or for side sleepers. It’s on a slight angle so this might take some adjusting till you find the perfect comfort spot. 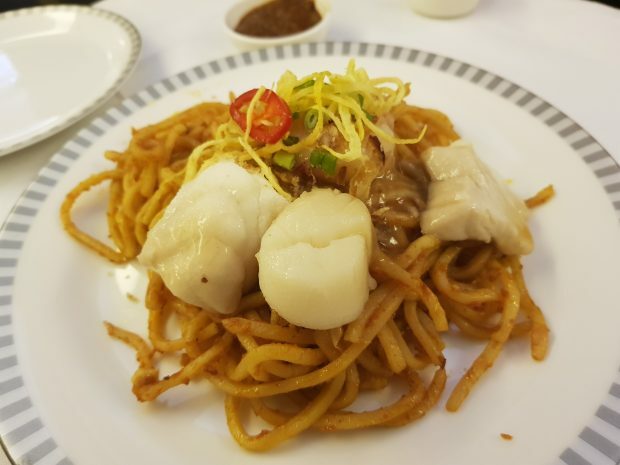 With about an hour to go until landing another light meal was provided, a choice of either quiche lorraine with spinach and bacon or braised ee-fu noodles with prawns, fish, scallops and leafy greens was on offer. The verdict: The flight arrived 20 minutes ahead of schedule which was warmly welcomed. 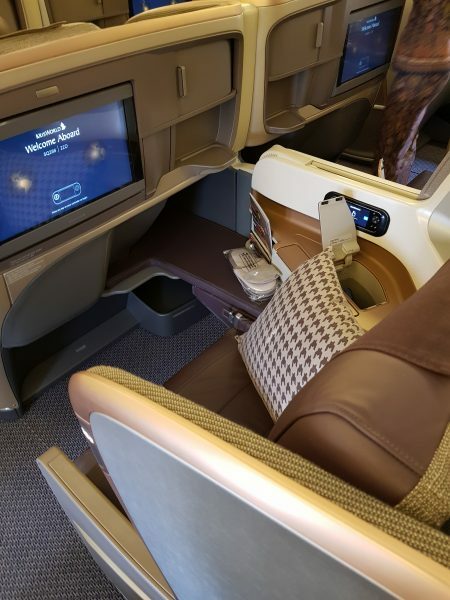 Coupled with the comfortable business class seat and service, there’s little to disappoint with the B777-300ER offering. 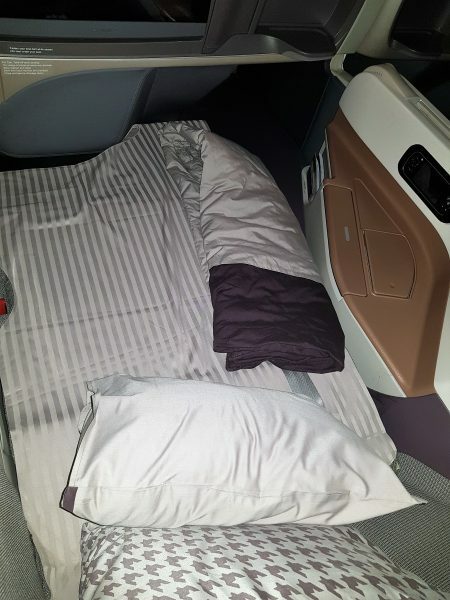 If you happen to prefer a Singapore Airlines Airbus A380-800 read our review here as there are some differences between the aircraft manufactures and the fit out. Once again service from staff was exemplary, the hardware modern and the embarkation / disembarkation prompt and orderly so it’s hard to see why you would want to choose another airline.